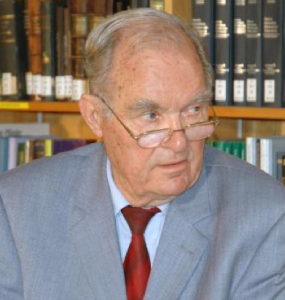 Dietrich Henschler (*19.11.1924, † 4.4.2014) was a German medic and toxicologist. For many years he chaired the German MAK-Kommission of the Deutsche Forschungsgemeinschaft (DFG), an institution establishing and setting workspace exposure limits. During WWII he served as a commander of German submarines. After the war he studied at the Würzburg University and wrote his PhD in 1953. At the Institute for Pharmacology he habilitated in 1957 with studies about the mechanism of action of the neurotoxin Tricresylphosphate (TCP). In 1964 Henschler became a professor with the Würzburg University and chaired the new instate for toxicology and pharmacology from 1965 on. He also was one of the publishers of the “Lehrbuch der allgemeinen und speziellen Pharmakologie und Toxikologie”, the German standard textbook for pharmacology and toxicology which is currently published in its 10th edition. He published numerous monographs about harmful substances in the workspace environment and also belonged to the protection commission of the German Ministry of Interior. In 1975 he was awarded the Federal Cross of Merit.